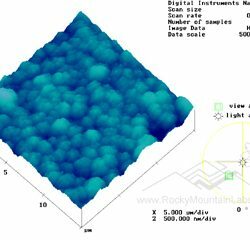 Scanning Probe Microscopy/Atomic Force Microscopy - Materials Science | Rocky Mountain Laboratories, Inc.
Scanning probe microscopy (SPM) refers to a family of measurement techniques that utilize a scanning probe. 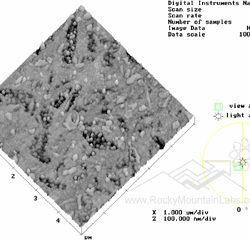 The most common measurement is Atomic Force Microscopy (AFM Analysis), which measures surface topography. 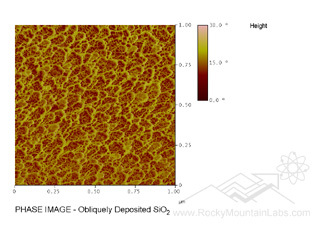 Imaged areas can be from the nm scale to as large as 100 µm X 100 µm. 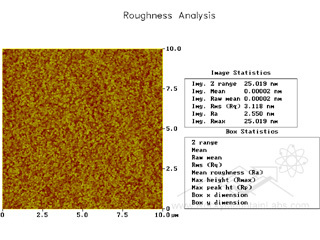 Heights and depths of features can be measured and many surface roughness parameters, e.g Ra, can be calculated. 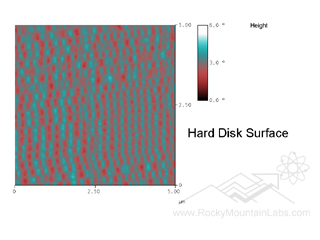 3-D images can also be produced for dramatic data presentation. Magnetic and electrical response can also be measured with SPM. 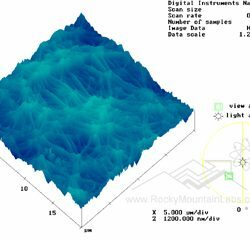 Scanning Probe Microscopy (SPM) refers to a group of techniques used to measure mechanical, magnetic, electrical, and electrochemical surface topography on a nanometer scale. It can measure features from as small as interatomic spaces to a tenth of a millimeter. The three dimensional resolution of SPM is unparalleled by any other technique. 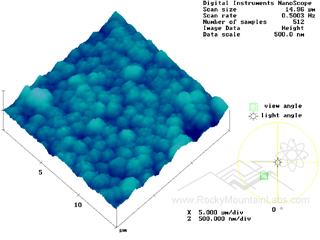 The ability to measure surfaces in three dimensions provides information that cannot be obtained with optical or typical electron microscopes. Unlike many stylus profilometers that only scan in a straight line, SPMs raster over a square area and give better and more precise topographical data. SPMs can be operated in air and liquids. This allows for the examination of a very extensive range of materials and environments, generally with no sample preparation. Examinations of biological materials can be carried out in appropriate solutions to preserve their vital characteristics. Data can be supplied as hard copy or in digital files for electronic transfer and further processing by the client. 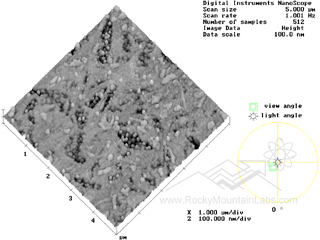 SPM can analyze solids, including biomaterials. Generally , no costly sample preparation or coating is required, since both conductive and nonconductive samples can be imaged. 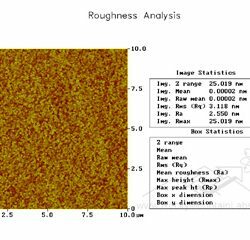 Usually, smooth samples are best and those that have macroscopic roughness with greater that 5 µm maximum relief cannot be analyzed. Sample sizes up to 8 inches in diameter may be analyzed. To obtain the most accurate results, surface features should not be mobile, because the stylus could potentially move them giving erroneous position information. Analysis times are in the order of thirty to sixty minutes dependent upon sample characteristics. Since SPM is a nondestructive technique, Rocky Mountain Laboratories can combine it with other analytical methods for subsequent analysis on the same sample to provide complementary information. In this technique, roughness and the sizes of surface features are measured by the mechanical movement of a diamond stylus over the sample. The trace of the surface is digitized and stored in a computer for display on a CRT and output to a printer. The stylus force can be adjusted to protect fragile surfaces from damage. The Stylus Profilometer can measure laterally to 1 µm and vertically to 5 Å with effective magnification of 20-100,000X. 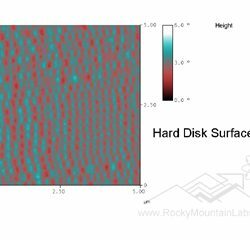 It provides good two dimensional topographical data and is nondestructive. *NanoScope™ and TappingMode™ are registered trademarks of Bruker, Inc.